If you thought you were being overwhelmed by Megaways slots last year, just wait until you see what's coming your way in 2019. With SG Interactive, Blueprint, Red Tiger and Relax Gaming expected to release a whole heap of renditions, there's a real risk of the market becoming saturated unless someone reinvents the Megaways mechanics and push the boundaries forward. More Bonanza clones just won't cut it anymore. So here it is, Kalamba Games first Megaways creation (powered by Relax Gaming) released without much fuss and preceded by pretty much no promotional efforts. It comes with a futuristic theme akin to I, Robot, the 2004 Sci-Fi blockbuster starring Will Smith, and at first glance there's nothing that really stands out as particularly original. In fact, aside from the jackpot feature it appears as a rather rudimental Megaways creation. Being a Megaways slot, however, there's a lot of potential coded into its RNG, which often is enough reason for punters to pay a visit. There are no major surprises in terms of features but a few things worth mentioning nonetheless. It includes 3 bonus jackpot levels - Silver, Gold and Platinum, the latter starting at 1000 times your stake. For every bet placed, each bonus jackpot value increases in proportion to the bet placed. The jackpots are triggered when 10, 12 or 16+ CYBORG symbols land on a single spin in both the base game and in the free spins. Central to the game is the Hyper bonus which is where you'll find nearly all of its potential. For those unwilling to wait for it to drop organically, there's a bonus buy option. 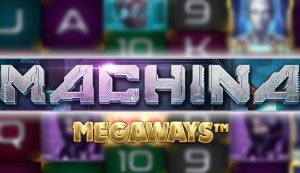 Machina Megaways is a 6 reel slot varying from between 2 and 6 rows per column that can combine to a maximum of 46,656 win ways. With a relatively high minimum stake of 0.60 Eur per spin, it's not very low-rolling friendly. For those with a bit larger gambling budget, Machina accepts bets of up to 36 Eur per spin. Visually, it's not bad at all even if the Asian futuristic theme is slightly over-used by now - most recently depicted in slots such as Big Bot Crew by Quickspin and Kaiju by ELK Studios, to name a couple. Gameplay is smooth and there's nothing negative to say about the interface nor the overall setup of the game. Symbols on the reels include 9, 10, J, Q, K and A royals as well as the 5 main characters of the story - the mysterious boy, the female operator, bearded guy, black-haired girl and the Cyborg. The latter is the most rewarding symbol, giving you 3.33 times your stake for 6 of a kind. The golden circuit board is the wild and replaces all symbols bar the bonus scatter and bonus accumulation symbols. There are two ways of gaining access to the free spins. The standard way is by waiting for it to drop "organically". If 3, 4, 5 or 6 scatters appear anywhere on the reels you will receive 10, 12, 15 or 18 free spins respectively. You can also buy the bonus - 10, 12, 15 or 18 free spins will cost you roughly 52, 89, 185 or 337 times your stake respectively. While the 18 spins option is quite pricey and possibly one of the more expensive bonus buy-ins we've seen so far, the cost of the 10 free spins is actually not that bad. The objective in the bonus is to collect the yellow accumulative circuit symbols to fill the meter to the right of the reel set. For every 4 or 5 accumulative symbols collected (depending on how far you've progressed), 2 additional spins are added to your total and, more importantly, one of the premium symbols (starting with the highest value symbol) is transformed into the Cyborg symbol for the remainder of the free spins session. Now, should you manage to transform all high-value symbols to replace them with the one Cyborg symbol, not only will you significantly increase your chances of landing massive mega wins, but also your chances of triggering the jackpots! Don't despair if it sounds too complicated. It really isn't. In fact, Machina Megaways is a rather basic and straightforward slot with no major surprises or weird, complicated features. It all comes down to landing accumulative symbols in the bonus in order to progress and transform the premium symbols into the Cyborg symbol. Buying the 18 free spins is expensive, but in turn you get to play a very potent bonus with potential to land wins of several thousand times your stake. Unfortunately, the max win potential is not stated anywhere but expect it to be at least a minimum 10,000 times the stake. It's a high variance slot, however, so tread carefully and don't go too nuts with the bonus buy option. Game description: 6 reels | Up to 6 rows | Up to 46,656 Ways | RTP 96.59% - 97.42% | Max win potential: 26,000x | Variance: H | Hit Frequency: 29.5% | Bets: €0.60 - €36 | Features: Jackpots, Hyper Bonus Free Spins | Release date: Out now!